AuburnSpeedsters.com was created due to my seemingly life long love of the Auburn 851 and 852 Speedsters. 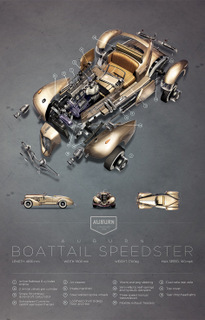 The flowing lines of a Boattail Speedster, whether it be an original 1935/1936 or one of the Second Generation Cars, is the quintessential example of Classic Automobile Art and Design. Since I would never have the $300-$500 thousand needed to purchase an original 1935/1936 Auburn Speedster, I went with Plan B... I purchased a wonderful "Second Generation" Speedster in the winter of 2000. It is a great car and is still a pleasure to own, drive and maintain today. Fast Forward 26 years to September of 2000. After returning from the Auburn Cord Duesenberg Clubs National Meet in Auburn, Indiana, I couldn't wait any longer. I started searching for a car. After a lot of research I decided that I wanted a Glenn Pray built car. I called Glenn and he told me of a few cars that he knew of that were for sale. I studied Hemming's Motor News and Surfed the Internet in search of the right car. I narrowed my search to two cars, both Red, one in Detroit Michigan and one in Turlock California. The Detroit car was a four speed car and the California car was an automatic. Being six foot two and knowing how little cabin space is available in a Speedster I opted for the California trip. Again I talked my buddy Dave into going with me... he is always easy when it comes to a Road Trip. Twenty six years later and boxes full of Auburn Speedster catalogs I was finally able to purchase my Auburn Speedster. 2016 Auburn Cord Duesenberg Festival - We were there! Another "Staple" Labor Day Celebration (at least for ACD Guys) has Come and Gone. The event took place in... where else, but Auburn, Indiana. Camera in hand, I was there, the weather was Gorgeous and I was looking at some of the most Beautiful Cars in the world. What else can I say. We added 4 pages of Festival photo's to the "Road Trips and Travel" page, Enjoy! This year's theme is "The Year of the Closed Auburn". To honor Auburn Drivers, the event is featuring a Factory Test Route Tour and Luncheon on Friday, September 2nd. All ACD Members are invited to drive their cars on this historic route. A special luncheon will held at the Autumn Ridge Golf Club. The Indiana State Police will be escorting the tour. Don't miss it - sign up today! Use this link, What Where and When, to start planning your Auburn Reunion Trip! The Keeneland Concours d'Elegance' 13th Annual event started out a little wet but soon dried out and the show went off without a hitch. Held again at the Historic Keenel and Race Course in Lexington, Kentucky. The Featured Marque was Chrysler, "Celebrating 90 years of Style and Innovation". The event takes in several days, but the Concours is held Saturday. That's where I come into the picture. Yes, as always I snapped plenty of pictures. Check them out! This Gorgeous 851 Auburn Speedster recreation belongs to Rowe Cavelli Sr. Rowe has always loved the Art Deco era of Automobiles and what better represents that period than the Gordon Buehrig designed 1935 Auburn Speedster. Plus! access to the "Thousands of Pounds" of remaining parts from the original Auburn Automobile Co. The Arizona Concours D'Elegance took place this past January helping Kick Start the Scottsdale / Phoenix area's Auction Mania. This years feature Marque was the Iconic Duesenberg and automobiles Sporting the Coachwork of the Italian Design House, Zagato. The event was held again at the Historic Arizona Biltmore Resort. Check out my event photo's! This years Auburn, Cord Duesenberg Reunion celebrated the "Year of the Duesenberg" and included the return of the Thunder Run. Thunder Run paid tribute to "Duesenberg's in Motion" and took place Sunday at the Goshen Municipal Airport in Goshen, Indiana using their 6000 foot Runway. These two related events as expected, drew a record number of Duesenbergs and Followers. Unfortunately due to a tight schedule we were not able to stay through Sunday to attend the Thunder Run. From talking with those who were there I missed a very Fun event. The turn out of Second Generation Cars on Show Day, Saturday in Eckhart Park, may have been down a little this year. The cars that were being proudly displayed by their owners were all very nice examples. I hate to admit it, but I was one of those "I did not Bring my Car" people. I had made plans to haul some Stuff back home with me while in Auburn. My Speedster, like all of them, is definitely short on Space, much less any "Extra Space". There is barely enough room for me and a passenger. I will try to do better next year by practicing what I normally preach, "Drive your Auburn to Auburn!" The Antique Automobile Club of America (AACA) celebrated it's 80th Anniversary in Louisville, Kentucky July 15th - 18th as part of the Southeastern Fall Meet. Louisville is right in my backyard. It is too bad that they do not have an "Annual" Meet in Louisville. Being so close to home and being a proud AACA member it made for a great opportunity for me and a buddy of mine to have our cars evaluated in the Historic Preservation of Features (HPOF) Class. The HPOF Class has become one of the most popular AACA Classes. The cars that compete in this Class are mostly Original Un-Restored Cars that are, in theory, to be used as a standard for judging the Restored Cars. We took my 1970 Continental Mark III and my friends 1985 Eldorado Convertible. I am proud to say that both cars achieved HPOF status. Five years ago the 75th Anniversary Diamond Jubilee Meet, was also held in Louisville. The 2010 show drew over 800 cars. According to a member of the AACA Kentucky Indiana Chapter (KYANA) this years gathering had only 323 cars register with a few less than that actually showing up. The Celebration took place INDOORS in Ice Cold Conditioned Air at the Kentucky State Fairgrounds, much better than the 90 Plus Degrees and the infamous Ohio Valley Hi-Humidity that was taking place outside. Admission to the show was free to the public to help promote the AACA. Unfortunately I believe they forgot to adequately advertise the show locally as the number of spectators attending seemed rather small - but that made taking pictures a lot easier. Our 80th Anniversary photo's are posted on the "Road Trips and Travel Page"
Use this link, What Where and When, to start planning your ACD Reunion Road Trip! We just returned from an Indianapolis, Indiana Road Trip to attend two C ar events. Our first stop was at the Famed Indianapolis Motor Speedway where the Sportscar Vintage Racing Association (SRVA) hosted it's annual Brickyard Vintage Racing Invitational. This is the second year that the event was held at the Speedway. More than 500 Vintage and Historic Racing Cars competed. Racing took place on the Famed 2.5 mile oval and on the IMS Road Course. The five day venue was expanded this year to include Motostalgia's Collector Car auction which took place on Friday. A Saturday morning Car Show, held on the Speedways Golf Coarse was also new this year. Over 1000 Show Car participants were expected. As you can imagine I shot quite a few photo's. You can view my Vintage Racing photo's here! From the Speedway we made our way to the Indianapolis Museum of Art to take in their Special Exhibit, Dream Cars. This temporary engagement will be at the museum from May 3rd - August 23rd 2015. Yes... "Got Dream Car photo's"
Devin Schoeffler contacted me and wanted to share some of his latest work in a series of exploded views of automobiles from the 1930's and 40's. The Speedster shown here is his latest. Devin is a 3D and Graphic Designer. I would say that Devin is quite good at what he does. Click on his 3D Auburn to enlarge it. Your Auburn Speedster could be the next Speedster of the Month! 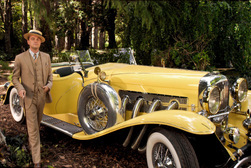 Sussex Collector, Roger Learmonth owns a very interesting and rare Auburn. It was featured as our August 2014 Auburn Speedster of the Month. His car is 1 of 8 right-hand drive cars built for export. This one was originally purchased by a wealthy plantation owner in the Philippines. It was hidden away during the war and remained in the Philippines for 50 years before be ing purchased by someone in Hong Kong who then sent it to England for some much needed refurbishment. Roger purchased the car four years ago after his search for it took him to Scottsdale, Arizona. Now fully restored his Auburn was recently displayed at the 2014 Goodwood Revival. The Goodwood Revival takes place each year in in September, near Chichester, in West Sussex England on the estate of Goodwood House. Friends of ours, visiting from the UK, told me about this event several years ago while they were attending the 2009 Auburn Cord Duesenberg Reunion. I have yet to Cross the Pond to attend, but it is on my "Bucket List". Last Fall Roger contacted me to share his research that he has put together for the Right Hand Drive Auburn speedsters . Roger's research is quite extensive, I quite impressed with all of it. As I read more of it I will be sharing with you what I have learned from Roger regarding these rare and very seldom seen cars. Shortly after this website was launched (2008) Frank Rotter contacted me from his home in Germany to share his passion for the Gordon Buehrig design 1935 and 1936 Auburn Boattail Speedsters. I soon realized that Frank not only loved these cars but he owned several 2nd Generation Cars and was very good at resurrecting tired worn out cars to life. We have posted several of his cars in both our Photo Gallery and our Work in Progress pages over the years. The 1935/1936 Speedsters garnered my attention when I was about 16 years old. From talking with Frank I learned that by the Ripe Young Age of 18 he was already a Proud Auburn owner, Geeze! what a Lucky Guy. 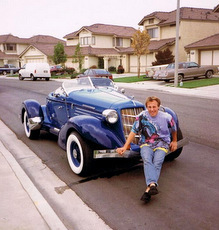 Pictured is 18 year old Frank with his Blue Speedster just before he had it exported to Germany. This particular car was used in the Blake Edwards 1986 movie, "A Fine Mess", starring Ted Danson and Howie Mandel. Frank has owned, restored and sold more 2nd Generation Auburns than anyone I know. Keep up the Good Work Frank. Keep in Touch! 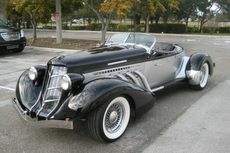 Do you have an Auburn Cord or Duesenberg that you are offering for sale. If so you may want to consider advertising in our "Speedster Market Place". The cost per listing is $59 for three months or $79 for a "Run until you Sell" listing. 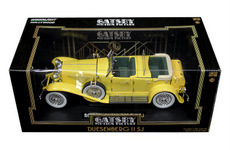 If you are looking for an Auburn, Cord or Duesenberg automobile or that Particular Part that you just can't find, you may try placing a "Wanted to Buy" listing. I can't believe the year is coming to an end. Peak Fall Colors "Have Peaked ", Auburn and Hershey have come and gone and I have already experienced Frost on my Windshield (no, not the Auburn's windshield ). I have been blessed again this year to have taken in quite a few Old Car even ts, a few new ones and most of my favorites. One of my favorites of course is the Auburn Cord Duesenberg Reunion, if attending Auburn isn't vacation enough, believe it or not, "The Wife" had a different kind of "Vacation" in mind. We were barely unpacked from Auburn before heading to Colorado and Utah. We love Rocks, especially the Red Ones. Having SOME input, I planned our trip leaving Colorado through the Beautiful Gateway Canyon area. As luck would have it, there just happen to be an automobile museum in Gateway, imagine that. The Gateway Colorado Automobile Museum is there. 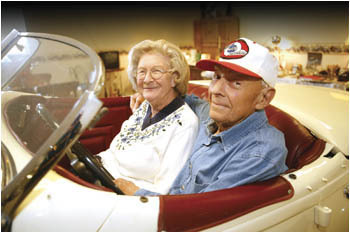 The Museum is owned by the Discovery Channel founder John Hendricks and it is home to his personal Car Collection. The Museum and his Collection of more than 50 cars are both some of the finest in the country. I took a bunch of pictures (as always) and have posted them on the website's Road Trips and Travel page. I believe you will enjoy them. We were not back quite a week before making a trip to French Lick, Indiana for the French Lick Resort Concours d'Elegance. This i s the second year for the event at it's new location. Last year's show was plagued with Rain, but not this time. The early morning air was Chilled but we soon had Plenty of Sunshine to warm things up. The venue for the French Lick Concours is perfect. The Show Field is located on the Valley Links Golf Course. The event is within walking distance of two Beautiful Historic Hotels, The French Lick Springs and the West Baden Springs Hotel. We stayed at the West Baden Springs and I highly recommend it. The featured Marques were Shelby American Cars. Special Attention was also given to Indiana built automobiles. Over 100 cars in 16 Classes from around the country competed for those coveted Best of Show and Best in Class awards. I hope this event continues it's success and grows to become a major player in the many Concours events held throughout the country. Guess What... Lots of pictures available to view. We still need photo's of your Auburn Speedster. Send us at least three nice picture's of your Speedster for our Photo Gallery. Everyone enjoys looking at pictures of the Auburn Speedster... YOU certainly do or you would not be on the website right now. Show Cars, Drivers, Projects Started, Projects Abandoned, Wrecks... We love them ALL. If you have an unusual Auburn related item that would work in the AUBURNmobilia Gallery send us photo's of it too! 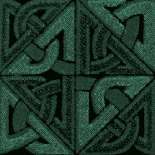 I recently discovered an interesting website, ClassiCarNews. It's a good place to grab your much needed Daily Dose of News relating to Collector Cars. ClassiCarNews. recently traveled to Auburn, Indiana to cover the annual Auburn Cord Duesenberg Festival, and cover it they did... the Auctions, the ACD Club Parade and the Car Show in Eckhart Park along with the Clubs Friday morning Swap Meet. Included in the articles are many nice photo's. I suggest marking them as one of your Favorites, I did. 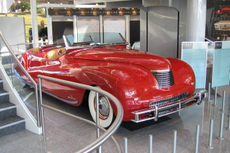 "Virgil Sciolaro has been crazy about his Auburn Boattail Speedster since he bought it at age 18. He was so impressed with his older brother's Speedster that he asked his brother to find one for him. "He could smell them out," Virgil said. Virgil bought his 1935 Speedster on time payments in October of 1945. The same car still sits in his garage. The Sciolaro brothers probably had the only two Speedsters in the Kansas City area in the late 1940s, and it's easy to imagine what dashing figures they cut behind the wheel. 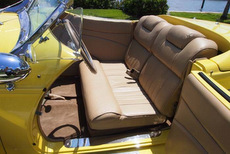 Virgil courted Dolores Sayers in the Speedster, and photos from their scrapbook show a young, vibrant couple"
Auctions America also offered one of the Nicest Second Generation Auburns (pictured above) that I have seen. It was built on an original Auburn Frame with Ford Running Gear and a suspected Glenn Pray body. The new owner is currently researching it's construction. EVERYTHING about the car looked Period Authentic. The car sold at auction for $90,750. It was that NICE! 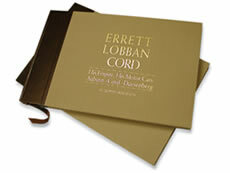 We have added s ome new pages to our website. 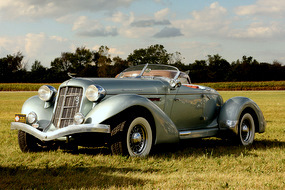 They are part of our revised, Auburn Speedster Photo Galleries page. These new and revised pages will again feature photo's of your Auburn Speedsters along with photo's of your cars in various stages of build, rebuild and or restoration. Even if it is just a modification that you would like to share, we are interested. 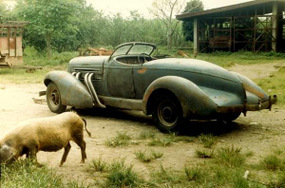 email photo's of your current and or past Auburn Speedster projects. Please include a short description of your car and what work is being performed. We can all learn from your shared experiences. If you have a Neat Garage that you would like showcased email us at least three quality photo's. We will be glad to post them in our Garage and Man Cave Gallery. Photo Galleries! The Sportscar Vintage Racing Association (SVRA) was responsible for this years inaugural event. SVRA is one of the largest and oldest Vintage Racing groups in the United States. They currently have over 1500 members. SVRA events are held throughout the year with Racing taking place at legendary Race Tracks like Sebring, Road America, Watkins Glenn, Circuits of America, Mid-Ohio and Now the Indianapolis Motor Speedway (IMS). We were there and just as you would expect, we were taking lots of pictures. Do Check them out, it was a Good Time! We also have photo's posted from a couple other recent Road Trips, including "Dana Mecum's Indianapolis Collector Car Auction"
We have added s ome new pages to our website. 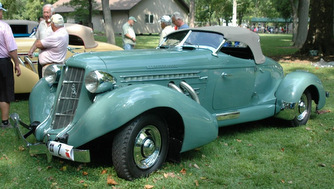 They are part of our revised, Auburn Speedster Photo Galleries page. These new and revised pages will again feature photo's of your Auburn Speedsters along with photo's of your cars in various stages of build, rebuild and or restoration. Even if it is just a modification that you would like to share we are interested. 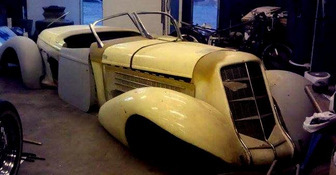 email photo's of your current and or past Auburn Speedster projects. Please include a short description of your car and what work is being performed. We can all learn from your shared experiences. If you have a Neat Garage that you would like showcased email us at least three quality photo's. We will be glad to post them in the new Garage and Man Cave Gallery. What else is sharing parking space with your Speedster? Send us your Photo's. Visit our New Photo Galleries! 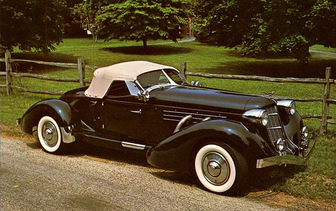 Do you have an Auburn Cord or Duesenberg that you are offering for sell. If so you may want to consider advertising it in our "Speedster Market Place". The cost per listing is $59 for three months or $79 for a "Run until you Sell" listing. Glenn Pray's book, "The Man Who Brought Legends to Life", has is now into it's third printing. This new edition has added a collage of photo's depicting Glenn, his family, his cars and his airplanes to the inside front and rear covers. The Book is a Great read for anyone with an interest the Glenn Pray Story; his purchase of the Auburn Cord Duesenberg Company and putting the Cord and Auburn Speedster back into production. These Books available on our website. They are $65 each, includes shipping and insurance within the Continental USA. email us for your copy.